2.0 mil, 400/1000 high tack/low tack acrylic, reverse wound, pressure sensitive adhesive double coated tape with a white tissue carrier on a polycoated kraft paper liner. For use with Scotch(R) ATG Adhesive Applicators. Jaco Aerospace and Industrial is your one stop resource for 2.0 mil, 400/1000 high tack/low tack acrylic, reverse wound, pressure sensitive adhesive double coated tape with a white tissue carrier on a polycoated kraft paper liner. 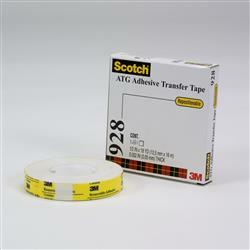 For use with Scotch(R) ATG Adhesive Applicators. and all of your 3M Products, Tapes, aerospace and industrial needs.